Saturday: Rain arrives. Highs in the 50s. Saturday Night: Cloudy, spotty showers. Lows in the 50s. Sunday: Muggy, few showers or storms. Late clearing. Highs in the 70s. Wet weather continues to expand through New England from southwest to northeast this morning, enveloping most of Southern New England by lunchtime. 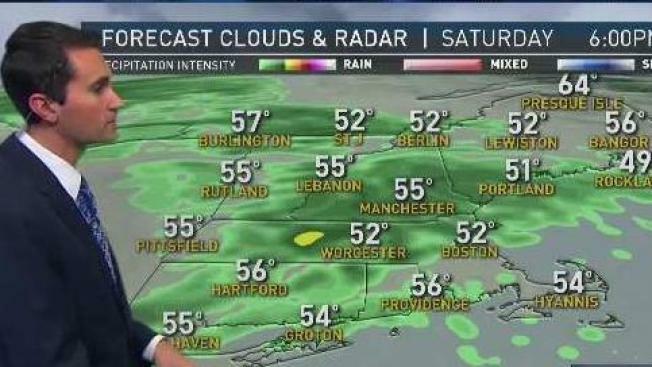 The rain expands into Northern New England during the afternoon. A wind off the water will keep temperatures locked in the 50s. Sunday brings a change in wind direction and a big boost in temperature. Highs surge into the 70s with more dry hours than Saturday. Even though there will be more dry times, still expect scattered showers and thunderstorms as a cold front nears. Behind that front on Monday a refreshing air mass settles in with highs in the 70s under sunny skies. A few more showers return by the middle of next week.